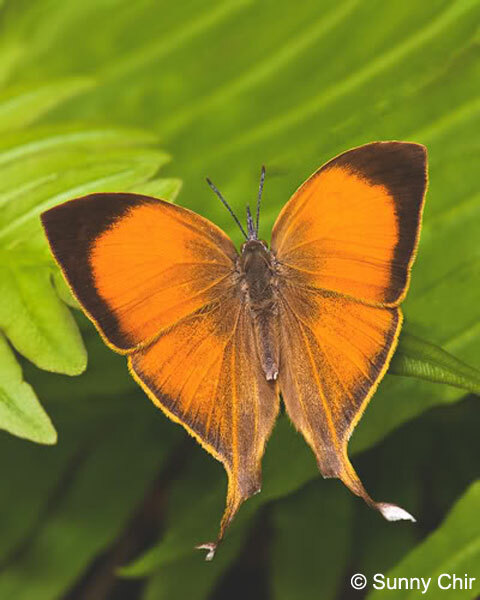 It's now exactly two years since the Butterflies of Singapore Blog started this series that features a butterfly species for each month. 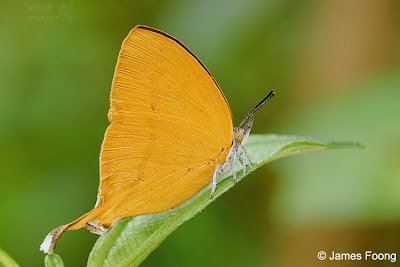 The Blog has chugged along steadily, providing and sharing information about butterflies in Singapore and the neighbouring region around our little island in the sun, and featuring the high quality photography of members of ButterflyCircle. At a regular rate of at least one article weekly, sometimes more, the stories and documentation of butterflies are only made possible with the help of the active members of ButterflyCircle who have unselfishly contributed their photos to make this Blog special. 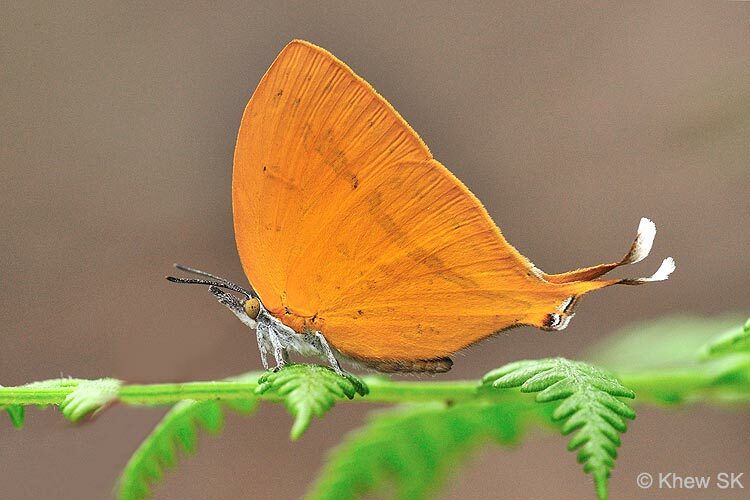 Particular mention must be made of Horace Tan, our early stages expert, for his excellent and painstakingly detailed documentation of the life histories of many butterfly species - some of which have not been recorded before. 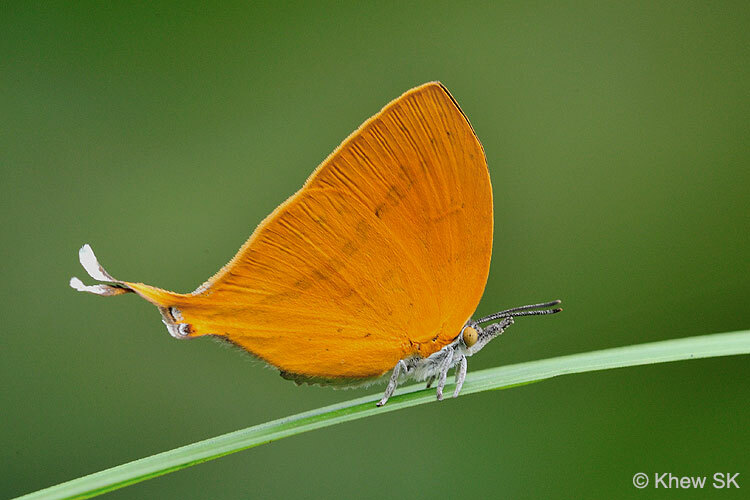 So, twenty four months have passed since we featured the Malay Lacewing as our first Butterfly of the Month back in December 2007, and now for this month of December 2009, we feature the small, but conspicuous and brightly-coloured Yamfly. 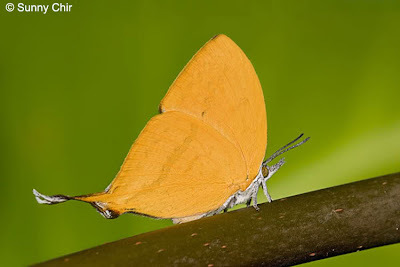 A relatively common species which is as often seen in urban parks and gardens as well as the nature reserves, the butterfly usually stays in the vicinity of its caterpillar host plant, Smilax sp., (probably S.bracteata). The Yamfly is a rich orange on the upperside, with a broad black apical border on the forewings above. 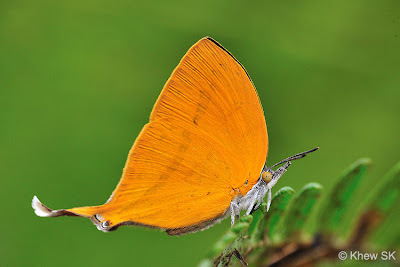 The underside is a lighter orange-yellow, with obscure darker orange markings on both wings. 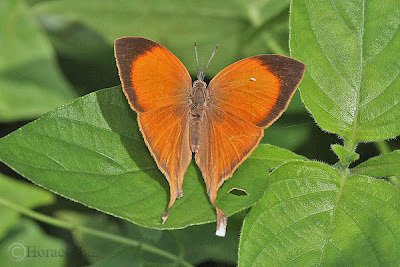 The hindwing has a prominent tornal lobe, with orange/black/white markings, and a broad tail extending from vein 2 of the hindwing, terminating in a blackened end with white tip. It is quite interesting that many Yamflys have been observed with their tails and parts of the tornal area torn off. Is it just wear and tear? 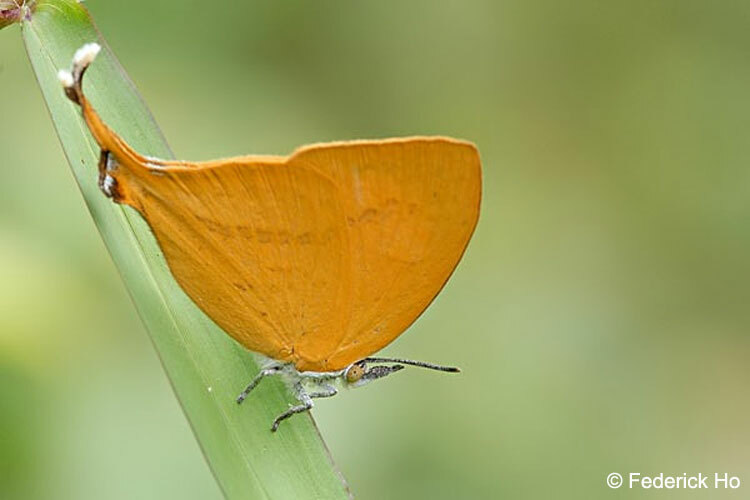 Or that the decoy of the head-like appearance is working well to fool predators into attacking the 'wrong' end of the butterfly? 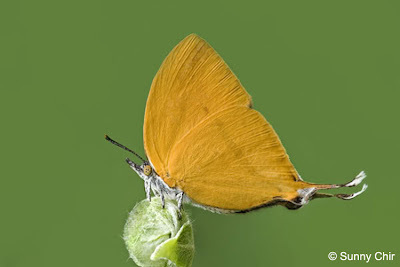 The butterfly is rather skittish most of the time, preferring to flit from perch to perch in the low shrubbery. 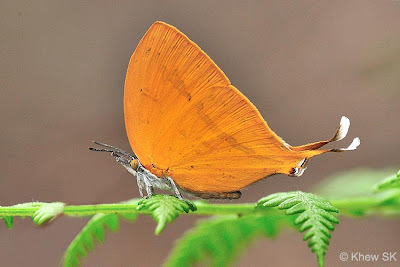 They generally perch with their wings folded upright, although some individuals have been observed to sunbathe with their wings partially opened during certain times of the day. 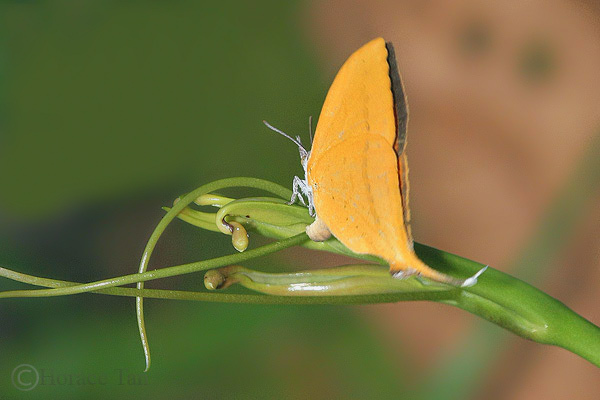 A female Yamfly ovipositing on the young shoots of the host plant, Smilax sp. They are often observed singly, and encountered as often at urban parks as well as in the nature reserves. Where it is observed, its caterpillar host plant, Smilax sp. is probably not too far away. The host plant is apparently a non-native invasive species that is notorious for strangling other plants and even trees, and is the bane of forest maintenance personnel in Singapore. It is likely that the Yamfly, and its associated species, the Branded Imperial, has host-shifted to this non-native Smilax, from their original host plants in Singapore. The caterpillar of the Yamfly feeds on the young shoots of the host plant, where the caterpillar mainly stays for its entire feeding lifespan. Read more about the early stages of the Yamfly here. There have also been instances where the Yamfly is seen feeding off the sugary young shoots and buds of plants, like in this wild orchid shown here, where it shares the nectar source with ants swarming around it. 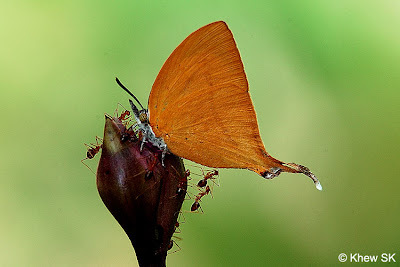 However, the ants do not appear to threaten the Yamfly, and it feeds rather nonchalantly amongst them, without fear of being attacked. Perhaps by instinct, the butterfly knows which ants are predators and which ants are not? And so, with this bright orange diminutive butterfly, we end the final month of the first decade of the 21st century and look forward to 2010 and more discoveries and new things to learn about our winged friends and Mother Nature's Flying Jewels. Have a Merry Christmas and a Happy New Year to all our readers and members of ButterflyCircle!